We are pleased to announce that Courtyard Marriott Montréal West-Island / Baie d’Urfé is the official hotel of “Cruisin at the Boardwalk”. 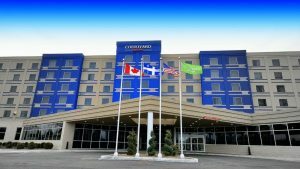 Located in the heart of the industrial park of Baie-d’Urfé, the hotel is 3 minutes from the exhibition site and is easily accessible by highway 40, exit Morgan Boulevard. Guests enjoy free Wi-Fi. Recharge and rejuvenate in the fitness center, indoor pool, dry and wet sauna and hot tub. Whether you are here for business or pleasure, the Courtyard hotel ensures you a more comfortable, productive and enjoyable stay!